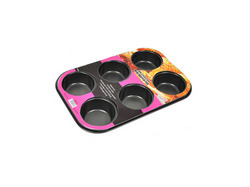 Ideal for smaller baking needs, this Mini Muffin Bake Pan holds six muffins or cupcakes. Made from carbon steel and featuring a non-stick coating, this pan is both durable and easy to care for. Each muffin mold is 1" deep. Total pan size is approximately 7.5" x 10.5". Comes carded.